1. You describe yourself as a Kitchen Witch. For those who may be unfamiliar with the term, can you tell my readers what that means? A Kitchen Witch is one who uses food, and the preparation and consumption of it to glean spiritual and personal goals. We use the power of intention and mindfulness to focus energy into food as well as awakening the innate magickal properties in food to help us along our chosen path. By putting love, joy and positivity in our kitchen and recognizing the power of ritual cooking a Kitchen Witch can create the sacred every day through simple recipes and make any meal magickal with the right tools and intentions. Make no mistake, you don’t have to be the world’s best cook and your recipes don’t have to be gourmet or high priced, just full of positive energy and joy and love! At least, that is how I see the world of Kitchen Magick. It is more about your energy than the food in your fridge. 2. 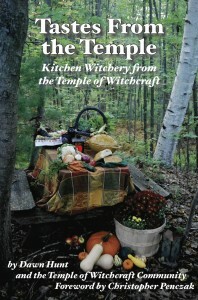 How did you end up working with the Temple of Witchcraft to do “Tastes from the Temple: Kitchen Witchery from the Temple of Witchcraft”? This book was something the Temple of Witchcraft wanted to do for a while, I’m told. However the project was put on hold until fate stepped in and put me in the right place at the right time! I had cooked for a couple of events and vended my Witchy Wares and I guess that they decided to put their faith in my abilities and know how as a Kitchen Witch. I am forever grateful that they thought so much of me!!! 3. “Tastes from the Temple” is a fundraiser for the Temple of Witchcraft, can you tell my readers a little bit about the organization? 4. In what ways does “Tastes from the Temple” differ from other cookbooks? In many ways it is a book in the true spirit of community cookbooks. The kind that old churches would put together to raise funds and unite spirits in a church or organization. But “Tastes From the Temple” has recipes from not only our immediate community but also from all over the country. Stories and anecdotes from Temple of Witchcraft members accompany every recipe so we can really get to know this community. I have taken each recipe and added a little dash of magick by including the innate magickal attributes of the foods, how and why to use them and for what magickal purposes. 5. One section of the book features recipes that highlight “Heirloom Magick”. Can you tell my readers a little bit about this tradition? Heirloom Magick is one of my favorite portions of the book. It is what I call the idea of cooking with and for the ancestors. We can stay connected to our past loves ones through food and keep their memories alive when we cook their recipes or use their kitchen tools. This is something I really started doing this past year after my grandmother passed away. I got a box full of her old pots and pans, even a muffin tin that had been my Great Grandmother’s back in Italy. I noticed how when using these as ritual tools really helped me to stay close to, not only my grandmother, but my heritage. Recipes I had never made before started erupting from heart and everything just tasted so wonderful and full of love and tradition. I love this type of food magick so much I have even started to teach classes on it! 6. 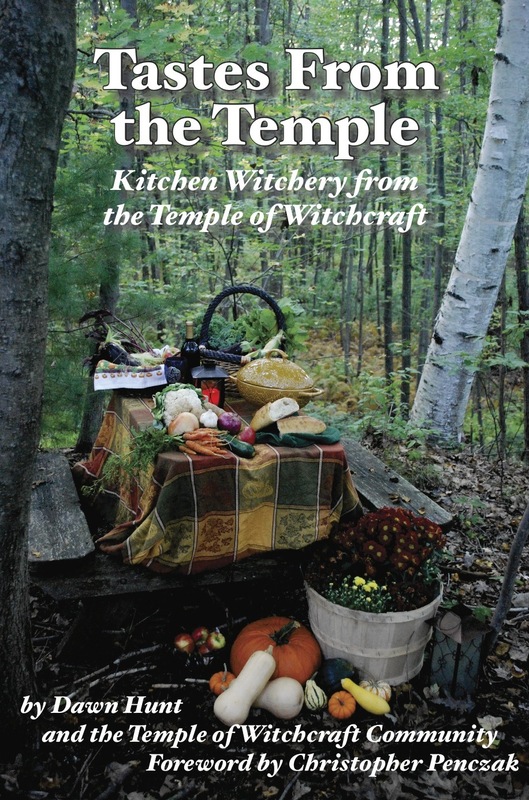 The Temple of Witchcraft community contributed many of the recipes featured in “Tastes from the Temple”, what is one of your favorites contributed from the community and why? I think one of my favorite contributions is from Alix Wright. She is a lead minister of the Temple and a very, very dear friend of mine. Her recipe is found in the “Sweets” section of the book. It is a fruit cake soaked in brandy for up to a month. Fruit cake is not something most of us find very appetizing but this one is so very rich and a little naughty with all that brandy! To be honest it is one of my favorites because it is something I never would have thought of on my own. It is very unique and has a history and a deep affection among Alix’s family and friends. In the true spirit of Kitchen Witchery this cake is made with love and patience and gets better with time. 7. Now I know this one is going to be really hard, but what’s one of your favorites of your recipes that you used in “Tastes from the Temple” and why? OH Yes. This is a very hard question…Hummm…I think it is a tie between the Pasta Fagioli in the Heirloom Magick chapter and the Three Bean Chili in the Witchy Entertaining Chapter. The Pasta Fagioli really rings true to everything I mentioned earlier about Heirloom Magick. When I cook it I am taken back to my childhood and cold Autumn nights after jumping in piles of leaves or walking the dog. And the Three Bean Chili is something I make all the time. It has become a staple in my home and for my friends. When I don’t have any in the freezer I make a huge pot of it to be sure that I always have some on hand. In fact, as I write this I am reminded that just yesterday my husband, Justin, asked when we were going to have some chili! It is easy, filling, healthy and comforting; wonderful for big crowds of people or for a cozy night in on the couch. I would be hard pressed to have to choose between these two! 8. Since these recipes are magical, they all magically have no calories, right? Of course! I have magickaly removed all the calories, fat, sugar and cholesterol! HA HA! The truth is many of these recipes are healthy options and many use good old fashioned butter, sugar, cream and/or beef! The key to anything is moderation. Enjoy everything, just don’t sit down and eat the entire pan of Four Cheese Baked Macaroni found in the Comfort Foods chapter all by yourself! 9. You’re always busy doing events and writing for websites and publications. Where can my readers see you, or read you next? WOW! I get to ask you a question???? OK…What is your favorite food to cook/eat and what magick does it hold for you? That’s tough. Due to some ongoing health issues my relationship with food has become pretty adversarial at times. These days I enjoy sushi greatly. I always liked it, but as long as it isn’t packing spicy stuff or fried stuff I can pretty much eat as much as my wallet allows. It’s tasty, fun, and we love our local place. We gave them cookies for the holidays! If I was healthy, I truly miss delivery New York style pizza. Not only is it delicious (in moderation, of course), but it’s the food of parties, of bad days at work when you come home and don’t want to cook, and of course, of rewarding groups for hard labor (like helping you move)! 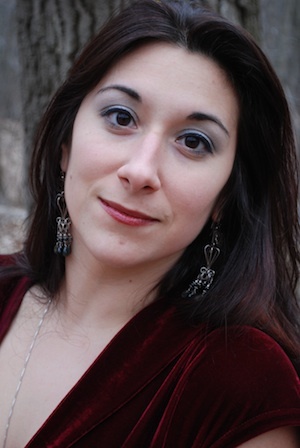 Dawn Aurora Hunt, known as “the Kitchen Witch”, is the founder of Cucina Aurora Kitchen Witchery. She teaches classes on Kitchen Witchery and food Magic, touring and giving workshops along the East Coast. Creating the sacred every day though simple spell recipes and kitchen rituals, Dawn has brought food Magick into the homes of Pagans and Non-Pagans alike. Through her line of infused olive oils, dips, cookie mixes, and Kitchen Witch Ware products she has shown that simple home-made foods are best for the body, mind and soul. She and her husband, Justin, live in the Merrimack Valley in Massachusetts. For more information visit her website: www.cucinaaurora.com and follow her on Facebook and Twitter at Cucina Aurora Kitchen Witchery. Witchcraft is a tradition of experience, and the best way to experience the path of the Witch is to actively train in its magickal and spiritual lessons. The Temple of Witchcraft provides a complete system of training and tradition, with four degrees found in the Mystery School for personal and magickal development and a fifth degree in the Seminary for the training of High Priestesses and High Priests interested in serving the gods, spirits, and community as ministers. Teachings are divided by degree into the Oracular, Fertility, Ecstatic, Gnostic, and Resurrection Mysteries. Training emphasizes the ability to look within, awaken your own gifts and abilities, and perform both lesser and greater magicks for your own evolution and the betterment of the world around you. The Temple of Witchcraft offers both in-person and online courses with direct teaching and mentorship. Classes use the “Temple of Witchcraft” series of books and CD Companions as primary texts, supplemented monthly with information from the Temple’s Book of Shadows, MP3 recordings of lectures and meditations from our founders, social support through group discussion with classmates, and direct individual feedback from a mentor. For more information and current schedules, please visit: www.templeofwitchcraft.org.